The spinners and launcher are made from five main components, all new elements. I’ll look at all of these in detail, plus some other interesting and surprising new elements. The first new part I’ll go over is the black spinner launcher (Element ID 6110042 | Design ID 18585). This part is two modules wide and six modules long. The key part of this handle’s function is the top section, which has a hole for the spinner to rest in and a slot for the ripcord. But the bottom section is also useful, essentially being a 2x4 brick with Technic holes that allows the launcher to be integrated into both System and Technic builds easily. 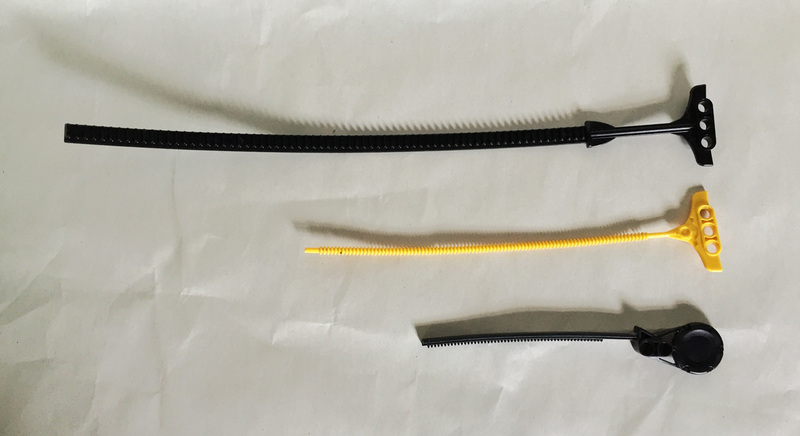 The black ripcord for the new spinners (Element ID 6109891 | Design ID 16965) is a new mold as well, different from the similar Chima “Speedorz” (middle) and Bionicle “Rhotuka” (bottom) ripcords from the past. Compared to those, the new ripcord is much larger—28 modules not counting the four-module handle—and while its handle resembles the handle to the Speedorz ripcord, it is a full module in width rather than a half-module. Of all of those past ripcords, I’d consider the new one superior, for one main reason—the teeth are the same as those for standard LEGO Technic gears. In other words, these ripcords aren’t limited solely to launching the spinners. They can also activate Technic functions, and in fact one upcoming set does just that—70735 Ronin R.E.X. has a launcher integrated into the back, but it also has a gear closer to the cockpit so that when you launch the spinner, it also activates gear-driven turbines on the front of the vehicle. But the ripcord could just as easily be used without the spinner launcher, so long as the build has a slot one module tall and one half module wide for it to be inserted into. This could make for an interesting and tactile new method of engaging Technic functions in MOCs. 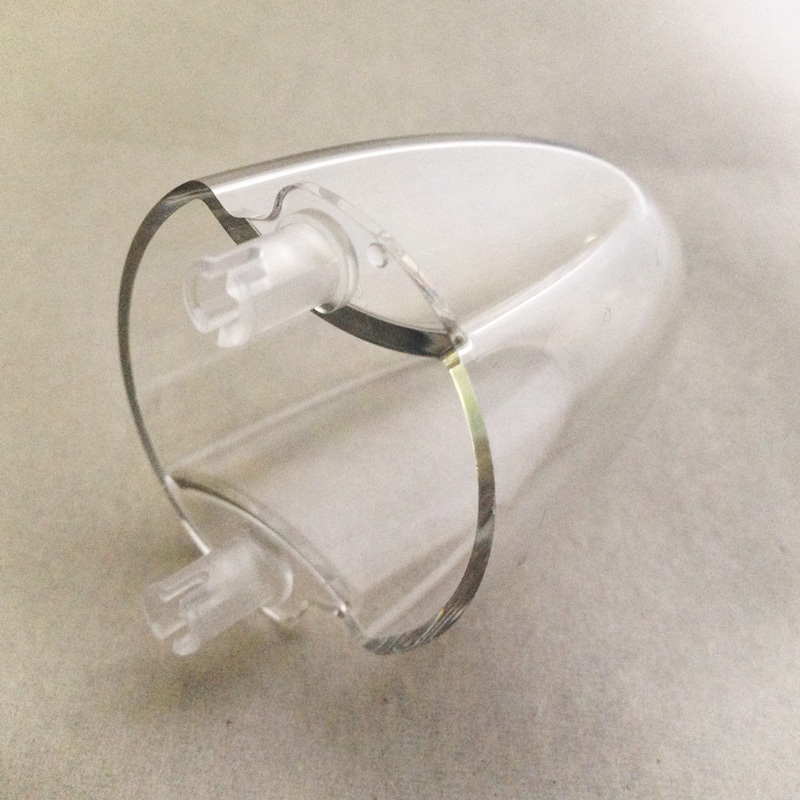 The third new part, which I’m sure will be well received by Spacers, is the Transparent [TLG]/Trans-Clear [BL] dome for each Airjitzu spinner (Element ID 6108477 | Design ID 18591). This part is four modules wide, and attaches with a Technic pin on each side of the base. It’s just big enough to accommodate a normal minifigure, though their feet will stick past the bottom even without shoulder or head accessories. 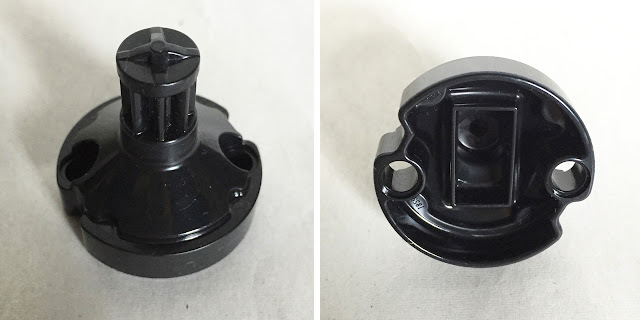 The fourth new mold is the base that holds the minifigure (Element ID 6110044 | Design ID 18590), which is the part the spinner “spins” on when it hits the ground. Like the launcher and ripcord, this part appears only in black, and is less obviously useful than the dome piece on its own. 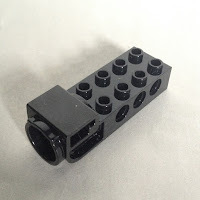 Still, it has several connection points, with two Technic holes and a 2x1 opening designed to hold a minifigure’s feet loosely, so it could be used for greebles or other detailing on a model’s exterior. This part is also the part that is geared to work with the ripcord, so it could potentially be made to function using other Technic parts with a bit of creativity. and Spring Yellowish Green [TLG]/Yellowish Green [BL] in 70744 Airjitzu Morro Flyer (Element ID 6117276). By slotting the assembled base and dome into the center hole of this rotor and twisting, the parts are locked into place—firmly enough to stay assembled when being launched at high speed, but not so firmly that it can’t be easily disassembled to remove the figure. Both the spinner base and dome must be attached in order for the spinner to snap together firmly and thus be able to launch—this non-standard connection method was likely intended to keep young builders from attaching other (potentially hazardous) parts, but the adult fan community has already begun to find workarounds and are making great progress toward this rotor’s potential for that holy grail of Technic functions, powered flight! There’s one other interesting new mold in all six of these sets, which I was not expecting at all. The Warm Gold shurikens (which, unfortunately, still only come in that color) may seem familiar, but they are a different mold than the similar ones that have been used since 2011 (Element ID 4600519 | Design ID 93058). The new ones (Element ID 6114925 | Design ID 19807) have textured grips like the Ninja swords. They also come on a sprue—a change that means that sets including them no longer need to include extras (which may be a downer for those who like extra parts but fixes the classic issue where even when representing the legendary “Shurikens of Ice”, they came three to a box instead of two). But what’s REALLY interesting about this new design is that the sprue for these, unlike those from the classic coins and flowers, is actually a functional element of its own even when the shurikens are separated from it! It features an indent that actually functions as an anti-stud, and is a full plate in thickness. This makes it like a 1x1 round tile with two needle-like points on either side, which will undoubtedly find great use for greebling with or without the shurikens still attached. 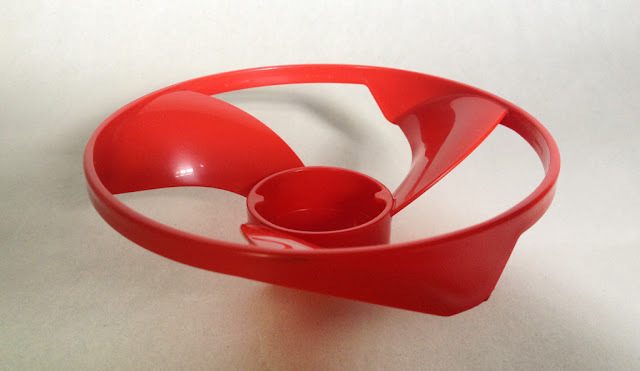 According to Nick Vas, this functionality was something of a happy accident—the connection would not actually function as such if not for the rubbery plastic used for this piece. 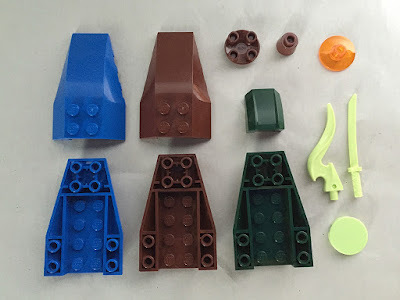 But as someone who always felt a pang of guilt when throwing away perfectly good LEGO plastic whenever parts came on a sprue, I would love to see sprues for parts like the classic flower and coin pieces follow this part’s lead. The handle for each Airjitzu set’s launcher features a special printed 2x2 round tile. Kai’s tile (Element ID 6115732 | Design ID 21304), Jay’s tile (Element ID 6115730 | Design ID 21289), Cole’s tile (Element ID 6115728 | Design ID 21287), and Zane’s tile (Element ID 6115727 | Design ID 21286) are Warm Gold, and all four are unique to these sets. Each one features an octagonal mandala-like pattern with elemental patterns and an Asian-inspired symbol (each one used on many of their respective ninja’s past designs, presumably to indicate that particular character). Morro’s tile (Element ID 6115726 | Design ID 21285) and Wrayth’s tile (Element ID 6116776 | Design ID 21502) are Spring Yellowish Green. Morro’s tile, which is unique to this set, features his dragon emblem, which resembles a darker version of the Green Ninja Lloyd’s. 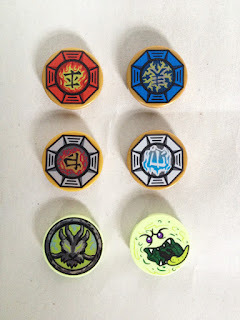 Wrayth’s tile is the only one that is not unique to these sets, appearing in several other summer Ninjago sets as ammunition for the 1x4 “disk launcher” brick introduced in this year’s Legends of Chima battle packs. It features a goofy, slimy-looking ghost face. Besides the brand-new molds and prints, these sets also include a few brand-new recolored elements. A Reddish Brown fez (Element ID 6062600 | Design ID 85975) appears for the first time in Airjitzu Kai Flyer. Airjitzu Jay Flyer includes one Bright Blue 4x6 bow brick (Element ID 6109995 | Design ID 43712) and one inverted 4x6 bow brick in the same color (Element ID 6109922 | Design ID 43713). Airjitzu Cole Flyer includes the same two parts in Reddish Brown (Element ID 6109997 and 6109924, respectively), along with a Reddish Brown 2x2 “boat stud” (Element ID 6037289 | Design ID 2654) and two Tr. Bright Orange [TLG]/Trans-Orange [BL] 2x2 radar dishes (Element ID 6109454 | Design ID 30063). Airjitzu Morro Flyer includes two new Earth Green parts: two 2x2 curved slopes with lip (Element ID 6113046 | Design ID 30602) and one inverted 4x6 bow brick (Element ID 6113029). Airjitzu Wrayth Flyer includes a “tribal flame” piece (new this year for the Legends of Chima theme) in Spring Yellowish Green (Element ID 6109564 | Design ID 18395) for the first time, and that set and Airjitzu Morro Flyer share some other new Spring Yellowish Green parts: one 2x2 round tile (Element ID 6113047 | Design ID 14769) in each set, and two ninja swords (Element ID 6116600 | Design ID 21459) in each set. These Spring Yellowish Green parts appear in some of the other summer Ninjago sets, while all the other new recolors are currently exclusive to these sets. Finally, there are a few more assorted parts I’d like to mention, which, while not new, are not necessarily common, either. Airjitzu Kai Flyer includes one minifigure “ice sword” in a fiery Trans. Red and Trans. Yellow blend (Element ID 6020758 | Design ID 11439), which has only appeared in that particular color in three other sets, and one Bright Red 4x6 inverted bow brick (Element ID 6096487), which was introduced this year and only appears in two other sets. Airjitzu Cole Flyer includes one Titanium Metallic [TLG]/Pearl Dark Gray [BL] orc sword (Element ID 6002758 | Design ID 10050), marking its first appearance outside of six Lord of the Rings/The Hobbit sets, and two Reddish Brown 2x2 curved slopes with lip (Element ID 6037241), which have only appeared in five other sets. Airjitzu Zane Flyer includes a Warm Gold polearm (Element ID 6013711 | Design ID 11156), which like Cole’s sword has never before appeared outside of four Lord of the Rings/The Hobbit sets. Airjitzu Morro Flyer includes three (two plus one extra) Sand Green unicorn horns (Element ID 6070905 | Design ID 89522), which had previously been exclusive to the large and expensive 70810 MetalBeard’s Sea Cow, two (one plus one extra) Sand Green spyglasses (Element ID 4649065 | Design ID 64644), which have only previously appeared in Lady Liberty from the Collectible Minifigures, and three (two plus one extra) Silver Metallic claws (Element ID 6004345 | Design ID 10187), which have only been available in four other sets. Airjitzu Wrayth Flyer includes several rare Earth Blue parts: two 2x2 curved slopes with lip (Element ID 6110004), which had only previously appeared in the 2004 set 4743 Ice Blade, one 4x6 bow brick (Element ID 6109996), which had only appeared in 4770 Blizzard Blaster from the same year, and one inverted 4x6 bow brick (Element ID 6109925), which appeared in four pre-2009 sets. It also includes one Silver Metallic 6M chain (Element ID 6064049 | Design ID 92338), which has only appeared in five other sets. The building process for the Airjitzu spinners and launchers is fairly straightforward, with all six launchers being built identically apart from their color. The main variety in the sets comes from the figures and the many weapons included in each. The four Airjitzu Ninja are all exclusive to these sets apart from Airjitzu Zane, who somewhat oddly is also included in the store-exclusive 70730 Chain Cycle Ambush. 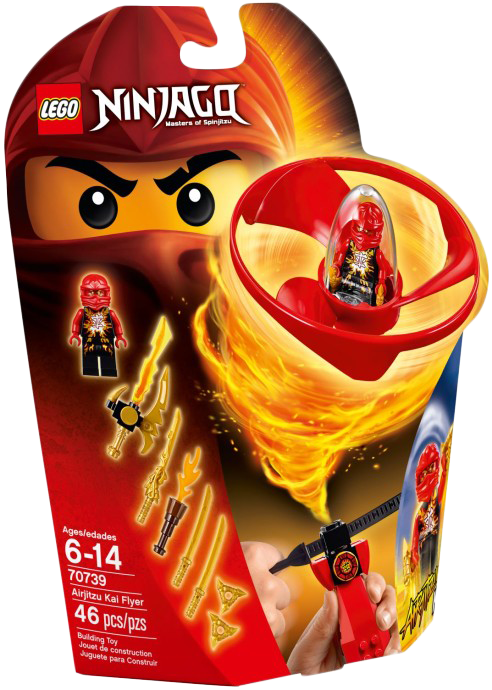 These versions of the Ninja are quite similar to the NRG Ninja from 2012’s spinner sets, insofar as they seem to represent the Ninja cloaked in elemental power. Each one features colored arms and faces, as well as colored, unprinted hoods for every ninja but Cole. Cole somewhat oddly uses Bright Orange as a secondary color, likely because his default Black would not stand out as much against the neutral Black used for all four Ninja’s printed torsos and legs. The front of each ninja features metallic elemental patterns surrounding the symbols featured on the aforementioned printed tiles, while their backs feature the animal-like emblems that have identified the ninja since their first appearance in 2011. The Ninja’s faces, like their NRG variants, have subtle elemental patterns on top of the ninja’s default expressions—but I’d like to call special attention to Airjitzu Zane, since his face maintains its new robotic appearance from this year. Morro and Wrayth are two of this summer’s new spectral foes, and while they are not unique to these sets like Kai, Jay, and Cole, they are still quite distinctive. Morro seems to be the leader of these ghost-like enemies, while Wrayth is identified as a “Chain Master” in product descriptions and is presumably one of Morro’s lackeys. Morro’s tattered costume seems to take cues from the designs of the original 2011 ninja designs, with the emblem also featured on his printed tile, and his back features the Chinese character for evil ( 惡 ). Wrayth’s torso and legs are both wrapped in chain patterns, as suits his title. Morro’s ninja scarf hides a Trans. Fluor. Green face with a cackling grin, while underneath Wrayth’s new tattered hood element are black bandage patterns on both the front and back of his head. Both figures have ghostly Trans. Fluor. Green legs, with prints unique to their respective characters. 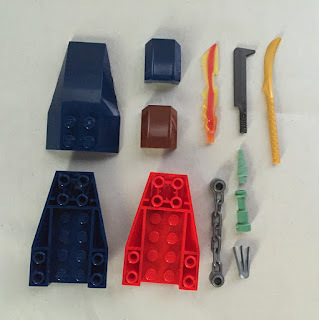 Since the construction of the spinners and launchers is mostly identical on all six sets, the weapons are some of the most interesting and diverse parts of the build. All six sets include shurikens (regrettably, the only weapons that fit inside the tiny Airjitzu capsules) and ninja swords used in the construction of the launchers. Kai’s additional weapons are 2011’s Dragon Sword of Fire, a massive fire sword, and a torch. Jay’s additional weapons are a spear, a double-bladed axe, and a very neat lightning device of some sort. Cole’s additional weapons include a giant battle-axe, an interesting sword/axe hybrid, and, humorously, a pair of sausages. Zane’s additional weapons are a polearm, two spiky ice-like weapons from the Galaxy Squad theme, and a bladed ice sword, along with a pair of ice skates. Morro’s additional weapons are a pair of claws, a thorny vine-like whip, a massive naginata, and a fluorescent spider. And finally, Wrayth’s additional weapons are a battle-axe, ghostly torch, and a dangerous-looking flail. It’s amazing how much personality is conveyed through these accessories alone, and I love the humorous touches like the sausages or skates. Of course, the real appeal of these sets is their functionality, and there’s no better way to demonstrate that than a video! By placing the spinner into the launcher and inserting the ripcord, the spinner is “locked” in place, not falling out even if the entire construction is inverted. By pointing the spinner upward and pulling the ripcord, the spinner flies high into the air. 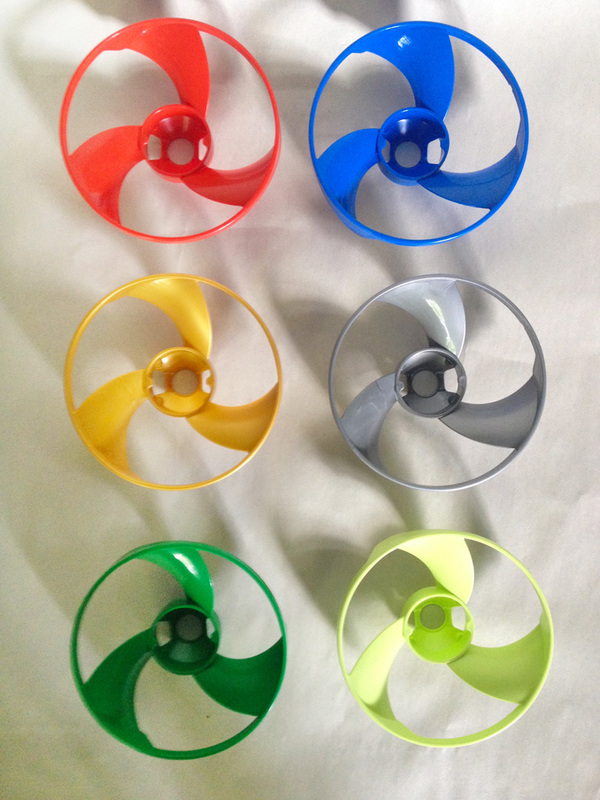 I felt that compared to the old Bionicle Rhotuka spinners, the increased size and weight of these new spinners gives you a good deal of control as to how high or far they launch. That weight doesn’t diminish the amount of lift they can achieve, though—the one time I attempted to pull as hard as I could outside my house, the spinner easily rose approximately two stories! When the spinner lands, provided it lands on a smooth surface like a smooth floor or thin carpet, it continues to spin like a top. You can also launch the spinner DOWNWARD to achieve a more typical top-like spin from the get-go—the dome-like shape of the capsule provides a perfect point to allow the spinner to spin upside-down. In fact, you can spin it upside-down even without the fan-like outer ring, though the resulting egg-like structure doesn’t hold its balance quite as well! So how do these compare to classic function-focused sets like the classic Ninjago spinners or the Legends of Chima Speedorz? Well, there are positives and negatives. On the one hand, the function is much more dynamic than either of the previous gimmicks. Flying things will never stop being cool. On the other hand, unlike the previous sets of this type, there’s not much of a “game” angle. 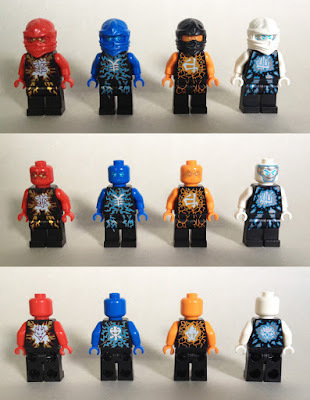 LEGO has shared videos demonstrating tricks like launching the spinners into basketball hoops (something I would not recommend, considering how merciless pavement can be to the bottoms of the plastic spinners) or hitting a spinner out of the air with another (which is easier said than done and will most likely result in both plummeting to the ground). But even skills like that amount to more of a toy than a game, and the new spinners lack the customization features of previous gimmick sets. Still, I would consider these more fun than the classic spinners or Speedorz, and the new elements used for these spinners are incredibly versatile, making them less likely to languish in your collection once the novelty has worn off. The main test of a new element’s usefulness, as far as I’m concerned, is whether it opens up new possibilities that older parts couldn’t provide. 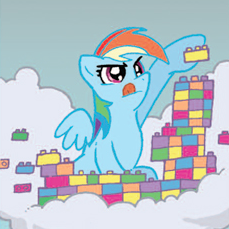 I think making your minifigures fly is unambiguously a case where it does! Thanks to Nick Vas and the NINJAGO team. Ninjago Airjitzu sets are available now. Consider using our affiliate links to buy them (or anything); this helps support New Elementary! that would be super awesome :) maybe with a single motor driving four rotors..
PS op, do you have a link for the discussions on this topic (powered flight) ? You will need a way to counteract the torque from the spinners if you want to build an aircraft. This is why typical helicopters feature a tail rotor: it stops them spinning out of control in the opposite direction to the main rotor's motion. Quad copters have four rotors, but two of them spin clockwise and the other two spin counter-clockwise. You'll need two of these rotors to be a mirror image of the others, because spinning them backwards won't create lift. Perhaps instead of four rotors, have eight. Build them in the usual quad-copter setup, but have one facing up and one facing down on each leg, driven by a small gearbox. Or just design it in such a way that spinning is minimized and/or part of the function. Turning them upside-down won't change anything. They need to be turned inside-out. In the TV show Cole says orange is his favorite color, so makes sense. Question: Does the sprue/piece have a part number? It's in the article: Element ID 6114925, Design ID 19807. That's for both shurikens on the sprue, mind you—the sprue itself doesn't get an ID because it's not produced or sold independently of the shurikens. Yeah. The sprue should have a number since it is a functional piece. I wonder if they sell it independently of the shurikens on Bricklink or something.